Another month in the 2016-17 campaign is in the books. 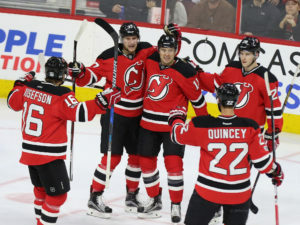 The New Jersey Devils flirted with being in striking distance of the final Wild Card playoff spot, only to be smacked back to reality. After finding new ways to lose, blowing leads and leaving precious points on the table, the Devils were left to trade what rental players they had for late-round draft choices and depth. Gee, and you thought Groundhog Day came at the beginning of February, huh? A February ledger of 4-4-3-0 gives the Devils a record of 25-25-12, 62 points, which is seven removed from the final wild-card position as of this writing. This team plays “well enough to lose” and is maddeningly consistently inconsistent, as their record illustrates. Unfortunately and miraculously for their sake, despite having an Eastern Conference-worst minus-35 goal differential, they wouldn’t even have a top-five draft pick if the season ended today. 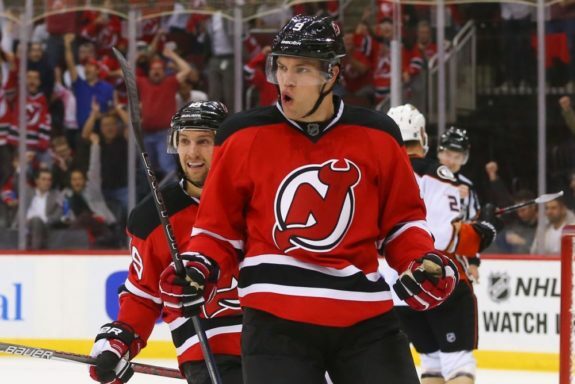 At this juncture, we take a look back at how the Devils have arrived at this point. The Devils captured their sixth straight road victory with an impressive 5-1 route of the Columbus Blue Jackets. Taylor Hall netted two tallies. Jacob Josefson and Travis Zajac also found the back of the net. Capping off the scoring was defenseman Seth Helgeson with his first career NHL goal. Zajac ended the month a five-game point streak. 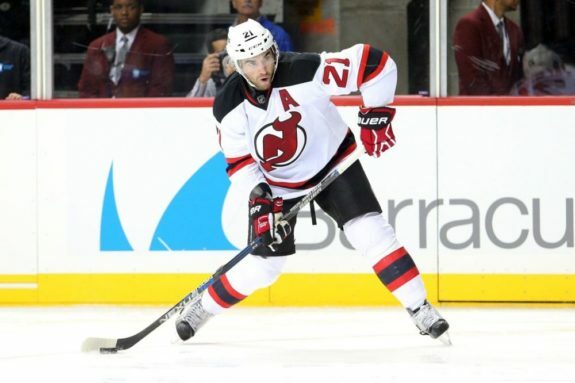 The Devils’ alternate captain registered four tallies and seven helpers for 11 points in February. Zajac ranks third on the squad with 39 points overall. Palmieri has regained his scoring touch from a season ago. Leading the team with 19 markers, Palmieri posted six goals in February. The Devils forward has also registered multiple-point games in three of his past four contests. Hall leads the club with 41 points. One can argue Adam Larsson was more important to the Devils than Hall was to the Edmonton Oilers, but there’s no disputing his production in the Garden State. In February, the Devils left wing recorded nine points. In three games against the Calgary Flames, New York Rangers and Montreal Canadiens, the Devils held a 3-2 advantage and lost all three in overtime, 4-3. Those three games all came at home (yes, even the game against the Rangers was a home tilt) and even worse, the latter two came in consecutive bouts, which is something that cannot happen if you’re in need of every point this late in the season. If the Devils hold onto all three contests, they’re four points out of a postseason berth. There were clunkers against the San Jose Sharks and Ottawa Senators, along with the aforementioned blown leads. However, a Feb. 19 6-4 loss at Brooklyn against the New York Islanders was brutal. After having downed the Isles 3-2 the evening before in Newark, they were again playing the team directly ahead of them in the standings and had their destiny in their own hands. Ultimately they were smoked, and the loss sent them sputtering to go winless in four straight games. The Devils were a better home team in the first half of the season but the second half has seen them morph into a better road squad. Hence, as their overall record indicates, they’re about a .500 team wherever they play. March will see the Devils hit the road eight times and play on home ice on seven occasions. The month begins with the Devils heading to play Kevin Shattenkirk and the Washington Capitals in D.C. New Jersey then heads to play at the Boston Bruins before hosting the Blue Jackets. After heading to Columbus, the Devils go further west to play the Colorado Avalanche and Arizona Coyotes. Upon returning home, the Devils host the Winnipeg Jets and Philadelphia Flyers. After a quick jaunt to play at the Pittsburgh Penguins, the Devils are home for two more against the Blue Jackets and Rangers. The schedule pattern continues as the Devils head north of the border to play the Toronto Maple Leafs, before heading home for two against the Carolina Hurricanes and Dallas Stars. Assuming they’re still remotely in the postseason mix, they’ll cap off the month with a bout at the Islanders.